The Uzbek government should unconditionally release all of its political prisoners on the 20th anniversary of the adoption of the country’s constitution on December 8, 2012, human rights groups said today. Freeing the country’s many political prisoners would demonstrate a genuine commitment to Uzbekistan’s much-touted reform process, the groups said. Several are in serious ill-health and at least seven have suffered torture or ill-treatment in prison. United Nations (UN) bodies and a recent reportby Human Rights Watch have found that torture and ill-treatment are systematic and widespread in places of detention. In one case, during an interrogation following the arrest of the activist Turgunov in 2008 on trumped-up charges, a police officer poured boiling water on Turgunov’s back when he refused to sign a false confession. He lost consciousness and suffered severe burns. Though Turgunov later revealed his burn marks in open court, the judge accepted as fact statements made by police that they had not tortured him. At the end of January, just days before his 13-year prison sentence was set to expire, authorities gave &Bekjanov, former editor of the political opposition newspaper Erk, an additional five-year sentence for alleged violations of internal prison rules. Bekjanov has been jailed since 1999. He and Ruzimuradov have been imprisoned longer than any other reporter worldwide, according to the Committee to Protect Journalists. 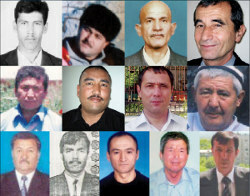 While the International Committee of the Red Cross (ICRC) &has access to Uzbekistan’s prisons and detention centers, its work is confidential and the Uzbek government prevents public scrutiny of its prisons by local civil society and journalists, international nongovernmental organizations, and reporters. For the past decade, it has denied access to all 11 UN special monitors who have requested invitations – including the UN special rapporteur on the situation of human rights defenders – and has failed to comply with recommendations by various expert bodies. The government has forced many international organizations and media outlets to leave Uzbekistan, and in March 2011, Uzbek authorities forced Human Rights Watch to closeits Tashkent office. The government denies registration to local independent human rights groups.